Toshiba continues to apply its seven-platter HDD platform to new applications and market segments, increasing hard drive capacity to 10 TB and slightly improving performance. Recently the company introduced its 10 TB HDD for SOHO and SMB NAS appliances that is designed to operate for 24/7 in vibrating multi-drive environments. The drive promises to be faster than competitors of the same class (and even some higher-end rivals), at a cost of a higher power consumption. 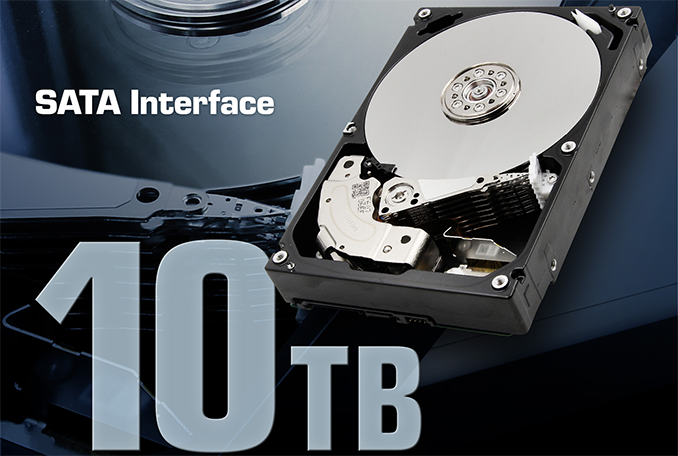 Toshiba’s MN06ACA 10 TB hard drive for NAS is based on the company’s HDD platform that leverages seven 1.43 TB PMR platters along with a 7200 RPM spindle speed, a 256 MB cache buffer and a SATA 6 Gbps interface. The 10TB HDD for NAS is well prepared to work in vibrating multi-bay environments — it features top and bottom attached motors, rotational vibration (RV) sensors that detect and compensate for transient vibrations, second-generation dual-stage actuators, and some other enhancements. To a large degree, the MG06ACA resembles Toshiba’s recently announced MG06ACA HDDs for enterprise/cloud datacentres and MD06ACA-V HDDs for video surveillance that use the same platform, but come with different firmware and components. The MN06ACA10T HDD supports 512e technology (4K physical sectors on the platter with 512-byte logical configuration reported to the host) to maintain compatibility with legacy applications, but is also compatible with modern NAS appliances. Meanwhile, unlike the enterprise-class MG06, the MN06 does not support persistent write cache with power loss protection technology. As for reliability, Toshiba rates the MN06ACA HDDs for 180 TB annual workload as well as for one million hours MTBF rating. Since Toshiba’s new 10 TB HDD is based on the company’s seven-platter platform, its performance is rather high — up to 249 MB/s sustained transfer rate, which is significantly faster when compared to other 10 TB hard drives for SOHO/SMB NAS (which feature a 5400 RPM spindle speed) and which even outperforms higher-end models for big business/enterprise NAS. Meanwhile, not everything is rosy with power consumption of the MN06ACA10T. The HDD consumes 9.2 W in operating mode and 7.2 W in active idle mode, which is 61% and 157% higher (respectively) when compared to the latest generation helium-filled WD Red/WD Red Pro drives. If you run a four-bay NAS at home or in an office of a small company and the HDDs sleep most of the time, power consumption may not be an issue worth talking about. But if you run a fully populated 8-bay NAS that is accessed 24/7 and spends 50% time in active idle (I am omitting cases when they actually perform read and write operations, but they naturally don’t play in Toshiba’s favour here), then the difference in power consumption between Toshiba’s MN06 10 TB and WD’s Red Pro 10 TB over three to five years will be rather noticeable ($48 in three years and $80 in five years, see the table below for details), but not critical, if Toshiba prices its drives right. Obviously, the relatively high power consumption is a payback for not adopting helium for the seven-platter drives, but avoiding helium lowers costs, so Toshiba gets more flexible in terms of pricing. *According to the U.S. Energy Information Administration, average retail price of a kWh was $0.1041 as of January, 2017. In the states of Alaska, California, Connecticut, New York, Rhode Island and Vermont electricity costs sigifnicantly more, at $0.14 - $0.17, so the HDD electricity costs will be different. Toshiba understands that power consumption is not a strong side of the MN06ACA10T HDD and officially positions the drive for SOHO and SMB NAS appliances as well as for archive and data backup applications, where it is not going to be a significant problem (archives and backups are rarely accessed and spend most of the time sleeping). Moreover, since formally the MN06 is positioned to compete against Seagate’s IronWolf and WD’s Red drives, it has an edge over rivals when it comes to performance. Toshiba says that its 10 TB HDDs for NAS are already available to interested parties. The company does not disclose pricing because it is subject to negotiations, as well as planned retail availability timeframe. It's somewhat funny to quote perf numbers for HDDs nowadays. Who cares what speed it is? It is going to go in a NAS with a 1gbps pipe and be limited to 100MB/s anyways.